Woodrow Curry III bounced between several Los Angeles area neighborhoods in his youth, but he never escaped his asthma. Curry’s experience underscores a dynamic disproportionately affecting people of color: He’s more likely to live closer to sources of industrial pollution and endure poorer air and water quality than his white contemporaries. The trouble for environmental groups looking to correct both institutional problems and historical events that have put minorities in neighborhoods more exposed to pollution is that they’re often singularly focused on solving pollution problems at the invitation of the affected community. Whether that community has a more robust housing policy plan to ensure rents don’t rise too quickly after remediation is usually outside their scope. And even if community activists seek such measures, city council members are hesitant to award rent control or housing subsidies because they can depress tax revenues by keeping higher, market-rate housing at bay. These concerns comes as new research sheds more light on the intersection between air quality, housing, and gentrification. The California electricity crisis in 2000 "unexpectedly and permanently" led to a fall in nitrogen oxide (NOx) emissions—a precursor to smog—largely because industrial emitters installed pollution control equipment rather than rely on a collapsing cap-and-trade market to meet new air quality regulations, according to a working paper by Daniel Sullivan, who wrote the study as an economic doctoral candidate at Harvard. The results showed neighborhoods with improved air quality post-crisis gained wealthier residents, but lost 60,000 residents who were high school dropouts—about 13% of the area’s low-education population, which Sullivan used as a proxy for income—all while total housing stock declined. That means the area’s most economically vulnerable residents were the least likely to benefit from improved air, Sullivan said in an interview. That’s because low-education residents, likely renters, either were unable to keep pace with rising housing prices or perhaps didn’t properly assess the health values of cleaner air, a task made more difficult when air pollutants are odorless and less visible, like ozone. At the same time, landlords sought more well-heeled renters or potential buyers. Longtime residents therefore left—where to, Sullivan doesn’t know for sure, but he suggested it’s likely they relocated to more distant neighborhoods where the air quality is worse. 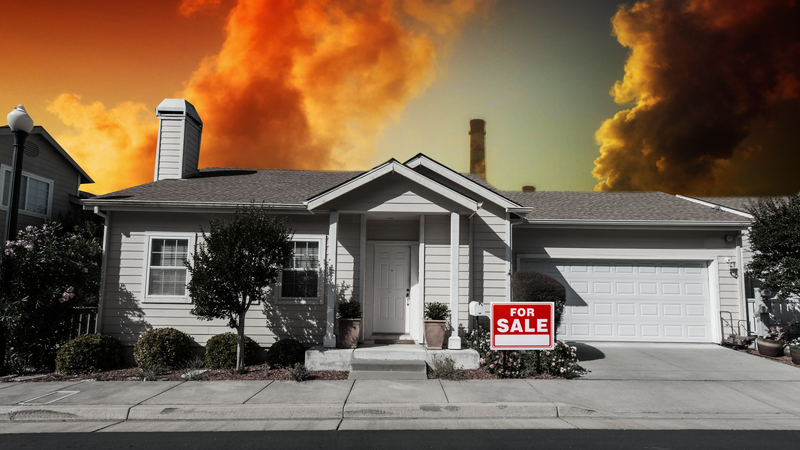 “The large outmigration of low-education residents, coupled with their low rates of homeownership, raises the possibility that they were even made worse off by the improvement in air quality and would have preferred it never have happened,” Sullivan, who is now a research fellow at environmental think tank Resources for the Future, wrote in the paper. Located near Los Angeles International Airport and surrounded by freeways, historically Inglewood was a magnet for smog—which is known to cause heart and lung ailments—and the area still deals with its fair share of pollution from aircraft flying overhead. But the city’s air quality is significantly better than many nearby communities, such as the more interior cities of Chino, Riverside, and San Bernardino. And given its proximity to the Los Angeles metro area’s beaches, its comparatively cooler climate, and access to the city and airport, Inglewood has other advantages. Throw in a planned light rail stop that would connect downtown Los Angeles to the airport, an urban core revived by the repurposing of The Forum—the old Los Angeles Lakers arena—as a concert venue, and the upcoming Los Angeles Rams NFL stadium, and you have a recipe for skyrocketing housing prices. “Inglewood is a mixed neighborhood like anywhere else in Los Angeles County. Inglewood has million dollar homes. … There is a false assumption that Inglewood is an impoverished community,” said Gerard McCallum, property manager for the Hollywood Park development in Inglewood, a project slated for completion in 2023 that will have 3,000 housing units, a luxury hotel, casino, and retail and office space. “[People] hear the rap songs and they just assume that that’s what it’s all about,” McCallum said. “What I think this work is showing, which is even more ironic, is that the same person who is getting the benefit can get the cost." McCallum's perspective might ring hollow for the 22.5% of Inglewood’s roughly 111,000 residents who live in poverty. The median household income is $42,249, about 24% less than the U.S. average of $53,657. The city is 43.9% black and 50.6% Hispanic, according to the 2010 U.S. Census. While a black middle class that came to Inglewood, largely from the Southeast United States, in the 1970s to work in the aerospace industry and a subsequent wave of Hispanic newcomers serve as the city's backbone, many worry a booming real estate market and housing crunch could push them out and into places with worse environmental and health profiles. “What I think this work is showing, which is even more ironic, is that the same person who is getting the benefit can get the cost. And if you don’t look at the cost, you might think you’re making them better off, but you’re making them worse off,” Spencer Banzhaf, an economics professor at Georgia State University who has worked on what he’s termed “environmental gentrification,” said of Sullivan’s study. Curry said he’s witnessing displacement happen in Inglewood, which was one of the cities that saw the biggest population swings in Sullivan’s study. While he and others say environmental factors aren’t the driving force behind such movement—housing shortages and prices deserve most of the blame—environmental issues are part of the tapestry of gentrification. A group of cyclists ride through in Venice, California. An influx of wealthy home buyers is driving real estate prices up, and affordable housing for local residents out. A culture clash has caused an upheaval in local politics that resulted in a city council feud. Curry, an organizer with Service Employees International Union (SEIU) Local 1000, is working with the Inglewood-based Social Justice Learning Institute (SJLI) on a comprehensive housing and environment plan. He’s pushing the city council to enact a rent control ordinance and to ensure any property on publicly owned land abides by the federal Housing and Urban Development standard for affordable housing rates. These worries underscore a phenomenon well documented in urban ecology circles: That adding significant green space or other amenities to once-blighted neighborhoods can attract wealthier outsiders who displace long-time residents. This is what’s happening in nearby Boyle Heights, a heavily Hispanic neighborhood that’s one of L.A.’s most polluted areas. About 75% of the residents are renters; the area has seen rapid gentrification as a result of an expanding arts district across the L.A. River, said Elizabeth Blaney, co-executive director with community group Union de Vecinos. Former Los Angeles mayor Antonio Villaraigosa shakes hands with voters during a campaign walk through Boyle Heights, the Mexican-American neighborhood where he grew up. Boyle Heights is attempting to address both gentrification and environmental pollution through Los Angeles’ “Clean Up Green Up” program, a demonstration project Los Angeles City Council approved in April for three of the region’s most polluted neighborhoods. It will require new or expanding housing developments city-wide to install state-of-the-art air filtration systems if located within 1,000 feet of a freeway, though much of those new developments will be at market rates that Blaney said would be unaffordable for the area’s longtime residents anyway. Blaney said the “Clean Up Green Up” model could serve as a template for addressing the issues of housing prices and environmental pollution. She said community organizers must consider those issues simultaneously. “I do feel that there needs to be a broader connection. There tends to be sometimes a very specific look at a very specific environmental issue. Which is good—that’s not a bad thing—but also looking at the interconnection is something that needs to be looked at more closely,” she said. Increasing homeownership is one of the best remedies for ensuring low-income residents retain the gains from improved environments, but Banzhaf said that while homeownership is desirable, awarding home loans to people who can ill afford them is what in part fueled the Great Recession. “One question that’s perennially asked is how much do we want to assist people with homeownership,” Banzhaf said, saying he preferred to “invest in people” through improved education or direct payments like the earned income tax credit so that they can take benefits with them rather than pin incentives to a specific place. Ever since the California legislature and Democratic Gov. Jerry Brown eliminated so-called “redevelopment agencies,” which incentivized construction in blighted areas, finding funding for affordable housing in the state has become more difficult. The state axed the program in 2011 to help patch the Golden State’s budget imbalance. But Scorza said other options remain, such as homeownership assistance programs. He also wants Inglewood City Council to set aside a portion of property tax revenues from the eventual Rams stadium, which will be built by 2019, for affordable housing. Inglewood Mayor James T. Butts Jr., whom developers have credited with a massive turnaround of the city’s finances, is working on a plan of his own. He wants to ask the Department of Housing and Urban Development if he can use federal dollars to create a rent stabilization program in Inglewood. The idea is the city would agree to maintain residential properties in exchange for landlords agreeing to rent control measures for five years. “It’s a concept right now. I don’t even know if they’ll let us do it. But I’ll tell you what—it’s a way forward, if it’s allowed,” Butts said in an interview. Curry said he’s looking for more long-term rent stability than Butts’ plan and, in any event, displacement is happening now. He doesn’t want other people to move like he had to when his parents moved in with Curry’s grandmother in Compton to save money when he was two years old. And he wants people to be able enjoy the healthy, sustainable Inglewood he’s hoping to help build. Zack Colman is the deputy energy and environment editor with the Christian Science Monitor. He was a Knight Science Journalism fellow at MIT for 2015-2016 and has covered energy and environment issues from Washington, D.C. since 2011.